Vandy Vape Kylin V2 RTA comes with 24mm diameter and 5ml huge e-liquid capacity. It adopts beveled air intake and cambered deck section to provide smooth airflow and pure flavor. It supports single coil or dual coils building. All parts of the RTA can be detached and reassembled, very convenient to clean and maintain. In addition, the Kylin V2 RTA features nifty slide out top filling system which makes refilling easier and avoid leakage. ➤ 1. Beveled air intake and cambered deck section provide smooth airflow and pure flavor. ➤ 2. 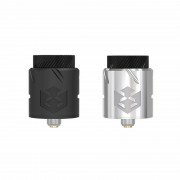 Kylin V2 RTA supports single coil or dual coils building. ➤ 3. 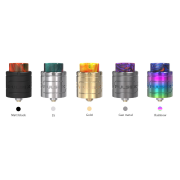 Kylin V2 RTA comes with resin drip tip and extra min regular Pyrex glass tube with huge capacity. ➤ 4. 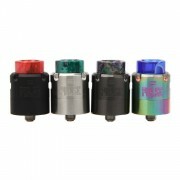 Kylin V2 RTA adopts nifty slide out top filling system to make refilling easier and avoid leakage. ➤ 5. All parts of the Kylin V2 RTA can be detached and reassembled, easy to clean and maintain. ❤ Please read the user manual carefully before using this Vandy Vape Kylin V2 RTA. 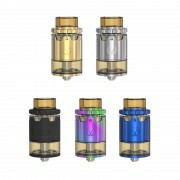 ☞ 3 months warranty period for Vandy Vape Kylin V2 RTA.